Do you love golf? Like really love it? Like wearing your full golf outfit when you watch the Masters love it? We get it, we love it too. What is the next step, you ask? Well, it’s a golf-themed party of course! We have all the golf party supplies you could ever dream of, from putt putt party accessories, cups, invitations, napkins and even mini golf birthday party tableware. We want you to have the best party imaginable, one that your friends will talk about for years. Our golf celebration décor includes the coolest golf party decorations around. So nice, in fact, even Tiger would be jealous! Don’t take our word for it though, get some for yourself. 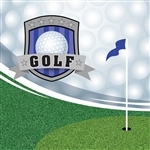 GOLFER T-SHIRT 1/pkg. - XL GOLF TOWEL 1/pkg. GOLFER ( MALE ) CAKE DECORATION 1/pkg. - 3 Fore! Hit a hole in one with a golf themed cake for the linksman in your family. Set this guy on his own frosting green or put him in the rough. We carry icing colors and decorator bags so you can design the course of his dreams - or nightmares!